Glenn Spearman’s Blues for Falasha struck many listeners as a step towards a more introverted mode of expression by one of the great fire-breathing free tenor players. I concluded my review of that outstanding recording with the comment that I wished we could hear a follow-up, and here, in a sense, it is. Even though Utterance was recorded nearly seven years earlier, it has been unissued until now, and while this duo effort obviously is very different from the kind of organization that went into Blues, a similar feeling of restraint pervades much of the proceedings. But Utterance is not so dark as the later record. The measured pace is certainly an intelligent response to the sax-percussion instrumentation, in which the temptation is to fill up the space instead of letting it become part of things as it does here. 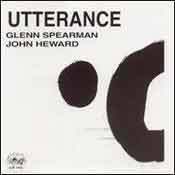 Heward certainly responds well; I have enjoyed his work elsewhere but he is really superb on Utterance; the sense of following or leading isn’t even there after a while-this is duo playing at the highest level. Hopefully there will be more posthumous issues to enhance Spearman’s reputation. In the meantime, this one is a knockout.